Siberia is a huge territory that extends to the east from the Ural mountains to the Pacific and the Arctic Ocean. Population density of this area is about three people per square kilometer, and this is one of the least densely populated places on Earth. Nevertheless, it was this territory that turned out to be a real treasure for archaeologists. Archaeologists have discovered the world’s oldest wooden sculpture during the excavation of a swamp in Western Siberia at the end of the 19th century. Idol’s age was estimated at 11,000 years, i.е. this idol is twice older than the great pyramids and 6,000 years older than Stonehenge. The 2.8-meter-high sculpture was carved from 157-year-old larch, which was processed by stone implements. Considering that the idol lay for thousands of years in a swamp, it has been perfectly preserved. Some believe that strange lines on the idol contain some encrypted information. Others suggest that this idol, which was once a height of 5.2 meters, can be a prototype of the Indian totem. In 1990, archaeologists discovered the remains of a female warrior in the Altai Mountains in Siberia. The 2500-year-old girl with pigtails, as scientists believe, was in the elite group of Pazyryk warriors. She was buried with a shield, a battle ax, a bow and arrows. Ancient Greek writer Hippocrates noted that the Scythians had warriors, called Amazons. Many thought that at last one of these mythical warriors was discovered. Nevertheless, DNA analysis destroyed these assumptions. It turns out that the girl was about 16 years old at the time of her death. “Amazon” was buried in the environment filled with symbols of fertility, such as shells, as well as amulets. Near her were the remains of nine horses, which suggests a high status of the girl. The cause of the death of the “warrior with a pigtail” remains a mystery. Many believe that cancer is a modern disease. Over the years, researchers have suggested that ancient people who were constantly active and ate natural foods had no cancer. Nevertheless, in 2014 a discovery was made that refutes this: the remains of a man who lived in Siberia in the Bronze Age, who died of prostate cancer. Although earlier cases of 6000-year-old benign tumors have been found, it is these 4500-year-old remains that are the oldest absolutely confirmed case of cancer. Most of the men stopping at this place were found in a posture on their backs next to guns for hunting and fishing. Nevertheless, the “man with cancer” was different from them: he was found in the embryo posture with a bone spoon, covered with intricate carvings, next to it. Archaeologists believe that the Ust-Taseyev idol was originally carved during the Scythian period, when the inhabitants of the region were Europeans. But during the early Middle Ages, the population of the Angara River region was “squeezed out” by the Mongols who came with the invasion. Archaeologists have recently unearthed a full set of bone armor in Siberia. 900-year-old armor was made from the bone of an unknown animal and was buried separately from its owner in the wooded western steppe near modern Omsk. While most of the finds in this area belong to the Mole culture, the researchers believe that the armor belongs to Samus-Daimin culture, which originated in the Altai mountains, before spreading to the southwest. The armor was found surprisingly in excellent condition at a depth of 1.5 meters. Archaeologists have discovered the world’s oldest sewing needle in the Altai mountains. A 50,000-year-old needle was found in the Denisova Cave and it was not used by Homo sapiens. The 7-centimeter needle has a hole for the thread, and it was made from the bone of a large unknown bird. It was found in the same layer as the remains of mysterious hominids – the Denisov man. In the Siberian republic of Khakassia archaeologists have discovered the remnants of the “noblewoman” of the ancient culture Okunev. Experts believe that Okunev culture was a Siberian ethnic group most closely associated with Native Americans. In the grave, dating from the XXV – XVIII centuries BC. The remains of the child and a huge treasure were also found. The tomb contained 100 ornaments made from the teeth of animals, their bones and horns, tools, two vessels, cases filled with bone needles, a bronze knife and more than 1500 beads adorning the burial clothes of “aristocrats”. The closed tomb was a stone slab with the image of a bull. 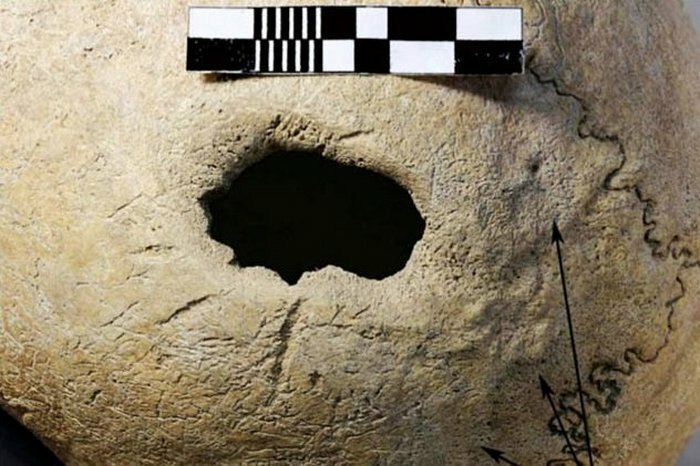 In 2015, archaeologists near the “Oil Pipeline 2” in Siberia found a skull on which there is clear evidence of an operation on the brain that was carried out 3000 years ago. The patient died between the ages of 30 and 40, and the open parietal bone of his skull had signs of overgrowth, indicating that he lived for a certain period of time after trepanation. Experts believe that his death was caused by postoperative inflammation. In 2015, researchers discovered the remains of two dead lions in the permafrost of Siberia. The animals named Dina and Uyan were 57,000 years old and they are young cave lions, which died out about 10 thousand years ago. They were old only 1-2 weeks, when the cave ceiling fell on the lion. The opaque liquid of white color, found in their stomachs, can be the oldest milk in the world. On the shores of Lake Baikal, an unusual burial was discovered this year. In the grave lay a couple who held hands for 5000 years. Skeletons of the Bronze Age, which belong to the eye culture, are believed to belong to an important person and his wife or mistress. In the burial were also found rings of rare white jade, rings, pendants made from deer bone and musk deer’s teeth, a 50-centimeter dagger from jade and a metal object of unknown purpose in a bag between the legs of a man.